went and had my haircut today... i was hoping to color it, but it still has too much color on it from the last time i had it done to be able to turn it as red as i'd like. my stylist suggested using dish soap as shampoo to break up the color... i'm going to try that after Christmas, since i'm not sure what it might make my current color look like! two coats Green Gala, one coat Seche Vite. i'm thinking this might have to be my Christmas mani... i usually go with red, but this polish is really speaking to me! maybe with some white stamping over it? thoughts? 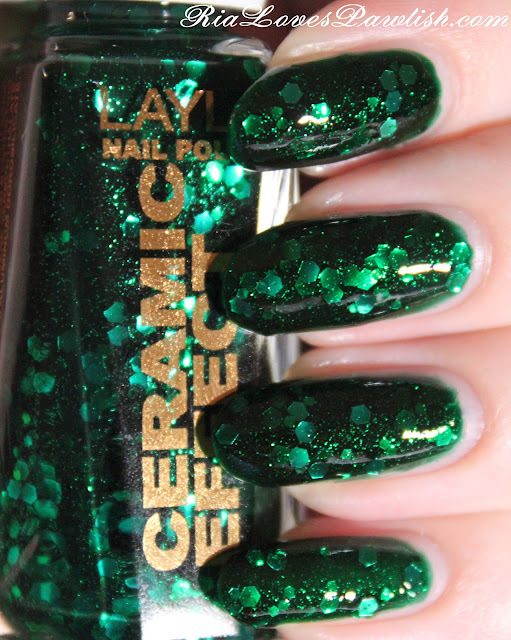 Layla Ceramic Effect polishes can be found at Ulta and Ulta.com, Zappos.com, and NinjaPolish.com for around $10! also check out the English version of Layla's website!